Marc Shapiro is a brilliant writer who became famous for his penetrating study of Rabbi Yechiel Yaakov Weinberg in his 1999 work, “Between the Yeshiva World and Modern Orthodoxy.” That work as well as his next book on alternative views in the Rishonim to the Rambam’s Thirteen Principles were both finalists in the National Jewish Book Award. Shapiro was also the last person to do his PhD under Rav Soloveitchik’s son-in-law, Professor Isadore Twersky of Harvard. His latest book, however, about censorship in the Orthodox world, has precipitated a bit of a mixed reaction in this reviewer. On the one hand, Dr. Shapiro has uncovered remarkable tidbits of information that provides much deeper insight into many an author’s original intents, nuances and meanings. He also makes some very strong points about how far the censorship has gone in our community as well as the irrational justification for it. Left unchecked, this tendency can and does redefine what is viewed as “truth” and can leave us questioning the credibility of many a work. Clearly, our tendency toward over-censorship in many areas could use some re-assessment. On the other hand, there is information revealed that had given this author a veritable kick in the stomach somewhat akin to the discovery that a well-respected Rabbi is not what he appears to be – a la many a recent headline. What do we make of a diary entry in an original manuscript of an auto-biography of one of the Gedolei haAcharonim that states horrifying information regarding one of his own contemporaries that heretofore had a sterling reputation? Do we disregard what is said? Or do we now regard the latter’s work in a new light? Perhaps we were better off not knowing, and since ignorance is bliss I would have preferred the original censorship of that manuscript. A third element that Shapiro has included his work – simply does not belong, as it does not add a whit to his underlying thesis that our censorship has gone too far. The fact that the Venice printing of many classical works included inappropriate pictures on the title page does not add to the author’s thesis that we are over-censuring. The artwork was from a time and place that did not adhere to the social mores of other Jewish societies – both before the Venice type-setters and after. Shapiro’s remark that to his recollection no religious authority ever commented that it was inappropriate is because it is quite obvious that such art does not belong on a title page of a sefer. The subsequent artistic changes to the artwork are interesting, however, they do not back up Shapiro’s general thesis. I would also liked to have seen Dr. Shapiro point out the censorship that had occurred in the reprinting of Irving Bunim’s commentary on Pirkei Avos. My original copy of Bunim’s Pirkei Avos commentary had numerous references to Shakespeare in it. The current version has had the Shakespearian references completely excised. Wouldn’t it be nice to see the comments of someone who had Yeshiva training and so much shimush of Gedolei Yisroel also inform us of the insights of Torah as it relates to Shakespeare? Now, no longer. the reader would have welcomed Shapiro’s cogent analysis of this. Publishers take it upon themselves – even without asking family members – to censor and republish the way they see fit. We lose by this, and to this Shapiro makes an excellent argument. The chapter on the censorship of Rav Kook’s haskamos from other works is informative and reflects a sad reality that we are redefining who and what our Gedolim are about. We forget that Rav Kook was Rav Elyashiv’s mesader kiddushin and that both he and Rav Shlomo Zalman Auerbach had the highest respect toward him. There is an unhealthy polarization that Shapiro warns us about in this chapter – a lesson we should heed. 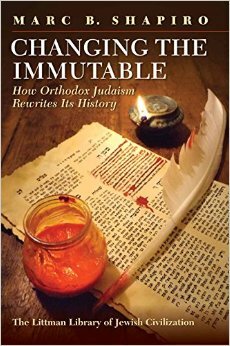 Yet at the same time, Shapiro’s book has an undertone of some ax to grind with the right wing Torah community. While it is true that much of the censorship is, in fact, excessive, there is a plethora of material that simply should not have been included in the book because it does not back up his thesis. There are times, of course, when censorship is just good editing or good business sense. Social mores do change over time and like it or not, the censorship to the general reader allows the reader to avoid seeing a warped or skewed work. As an example – Old English was once a living, vibrant, and spoken language. Reprinting a work in Old English can sometimes give the reader a warped view of the work precisely because the Old English no longer reflects the vibrant spoken language it once was. The change to modern idiom is thus not true censorship at all, but rather a form of upgrading. Shapiro’s inclusion of some of such material does not reflect this notion. The chapter on censorship in halachic works should also have included a discussion of machshirei ochel nefesh, the groundwork to the preparayion of food, and the out and out permission to teach it when its laws do not apply imminently contrasted with the obligation to suppress information about machsirei ochel nefesh when it is actually relevant to the questioner. This whole concept would have informed the reader about the issue of censorship more fully. The various approaches and explanations of this halachic quirk would have been very welcomed. And perhaps I am just needling the author here, but it also seems that Shapiro has done some of his own censorship too. In his analysis of various versions and translations of Eli Weisel’s “Night” Shapiro’s innocuous translation of Yiddish terms with a more pejorative connotation reflects some of the same supposed censorship that he is knocking. In conclusion, this book, like Shapiro’s previous works, show the author’s remarkable industry and analytic depth, but it has included material and information, that although may be of great interest, does not shed further light on the author’s thesis. It also failed to include other relevant material that would have deeply informed the discussion. Notwithstanding these two criticisms, it is this author’s view that the book will prove to be very popular. Any living culture changes over time, including Orthodox Judaism. We gave up ingredient kashrus for our current system of agency kashrus since the food industry changed (previously all food was purchased directly from the producer and always in your own community). As formal schooling replaced apprenticeships, we moved secular studies into schools (rather than as something you did once you picked a career). As clothing styles changed, we adapted (switching to men wearing pants, women wearing bras, use of synthetic fibers). We eliminated the “bethrothal” as something distinct from the wedding. Those who complain about the pace of change or the direction of change pretend to be in favor of “change” but in reality want the Orthodox community to move away from Torah and MItsvos. Their complaint is not that the frum community is unchanging, which it obviously isn’t – but that the changes that occur are not in the direction they desire. Marc Shapiro is a brilliant man, his blogs can be read on seforimblog. His main tactic is too reveal some controversial/very surprising information to keep the reader reading and interested. I don’t pretend to know if what he’s doing is healthy for the general collective since his wealth of information is often used by Torah haters. I fear that this man was blessed with the gift of a sharp mind and tongue and for this reason he must not be reckoned with. Seriously, Hoffman, seriously? You’re going to pump this rabid Chareidi hater with a notorious history of attacking Chareidim, this Professor Marc Shapiro? Shapiro has a long and notorious history of attacking anything and everything Chareidi. He went so low as to viciously attach Maran HaGaon HaRav Menachem Mann Shach ztvk’l during Rav Shach’s lifetime. This is all just some samples. Shapiro has made a career of writing against Chareidim. Obviously ,many are incapable of subtly catching what is left unsaid -and that is how it should be. If they have a problem with that,let them attend Special Ed. I told Marc Shapiro a few years ago that his title “Between the Yeshiva World and Modern Orthodoxy shows bias and is disingenuous. A more appropriate title would have been “Between the Yeshiva World and WESTERN Orthodoxy” and gave him proofs accordingly. Having only received my copy of the book Yesterday, I cannot respond to R. Hoffmans review, but I think akuperma has missed the point of the book. It is not that Judaism or Orthodoxy changes, it is the fact that it tries to cover up and censor the fact that the change has occurred, by trying to show that earlier Rabbis had views and opinions that they didn’t really have. Marc Shapiro introduced us to the fascinating letter written by Rabbi Y. Y. Weinberg ZT”L, where he laments about our attitude towards Eino Yehudim. He strongly urges us to follow the Me’eri’s opinion that all Halochos which diminishes the value belongings of an Eino-Yehudi, do not apply to today’s civilized Nations. The truth is that in the 1700’s & 1800’s Germany was very civilized to the Yidden, but unfortunately Yidden did not reciprocate. Yes, at times it bothers me too very much, the over censoring. Marc Shapiro has a sordid history attacking chareidim and displaying an ignorant hatred of them and their Torah lifestyle. to sweep the TRUTH under the rug!!! Rewriting history is a blatant sign of the needs of a weak & confused generation. The sign of maturity is being able to accept other people’s views without resorting to name calling. Those of you who are mature, raise your hands. Problem with orthodox Jewry? Always want to put on a charade to push their agenda. About the only thing they have not yet tried is being makadesh Shem shomayim on a global scene. That proves too difficult to accomplish. It is easier to falsify history. Rabbi Hoffman has ,as usual, unwittingly exposed his narrow mindedness regarding those whose hashkafah differ than his own. To wit, he justifies Rav Kook’s legitimacy by the fact that Rav Elyashiv was his mesader kiddushin. Actually, the reverse is true. Rav Elyashiv attained legitimacy by virtue of the fact that the great Rav Kook was his mesader kiddushin. Lior, it’s time you read what the consensus Litvishe Yeshivishe Oilam, based in Rehov Chazon Ish 5 in Bnei Brak , has to say about the legacy of Rav Schach. Try not to collapse from shock when you do read up on it. old man: You’ve been posting here your left-wing so-called “orthodox” drivel for years already. You keep repeating the same mantra. Yet whenever people actually look up what you claim it inevitably turns out to be fabrications of yours. Your use of sophistry and language in a vain attempt to cover your tracks has no traction. 1. Censorship? There is an איסור לשון הרע, and if there is no תועלת, then it is אסור to write, to listen, to read, and to believe. That is even if it were true. 2. אם ראית תלמיד חכם עובר עבירה בלילה אל תהרהר אחריו ביום. 3. Will reading this book increase your אמונה? Your יראת שמים? Or the opposite? Better to just stay away. Sadly much of what he wrote in his later years , has to be taken with a couple grains of salt. He was left with a lot trauma from surviving the holocaust in a russian generals’ POW camp,and struggled with it through his dying days. And that he was so tired of mizrachi chicaneries [in those days! ]that he desired to start a new faction/group. And the conclusion that indeed that was the reason the nazis plucked him out of the Warsaw ghetto and chose to save him. NaarYisroel: But the book IS l’toeles. Now you know not to believe everything you read in frum literature. You also now know that frum people may take the liberty to write things that are really not true in order to further their own agenda. You also now know that some seforim are reprinted with deliberate changes in them, and that, if you can, you should go back to the original source. Also remember – the seal of HKB’H is emes (truth). Surely I am not the only one who feels the correct answer is obviously “NO”? Outside of an academic setting, why would any ben Torah care, in the slightest, about Shakespeare’s writings? Regarding Rabbi Kook, the pendulum of censorship has, if anything, swung far to other side of censorship, to expunge anything that would cast Rabbi Kook in a bad light. True, he was the mesader kiddushin of the young Rav Elyashiv. That was a long, long time before he became Rav Elyashiv. But does anyone write about the Chazon Ish’s opinions about Rabbi Kook and his prohibition to learn from Rabbi Kook’s hashkafa sefarim? How many know of Rav Baruch Kaplan’s lament that the Chevron massacre was a result of his “Shema Yisrael HaKosel Kosleinu HaKosel Echad”? Even Rabbi Soloveitchik of YU, the head of “RZ” in America, was “not impressed with his scholastics”. That last one was censored after its publication in the first edition. I read the book cover to cover (practically in one sitting). Those above who resort to character assassination are revealing either their ignorance, their discomfort or both. This book, like any scholarly publication, is based upon citations to evidence. The motivation of the author is hardly relevant. Everything he states is sourced and the reader is welcome to explore the sources (as I myself have done). Shapiro’s bias, if any, does not come in to play when evaluating the evidence he places before the reader. Go ahead, look it up, prove me and Professor Shapiro wrong. Check out Rav Elyashiv’s past, check out Rav Schach’s past, by the way, did you ever have a personal meeting with Rav Schach, just you and him and no one else? I did, three times.Put some facts where your holy kulmus is. I’m waiting.Oh, sorry. To do that you’ll have to learn how to read Hebrew and not just Art Scroll biographies.It could take some time. I’ll still wait. #10- Harav Kook zt”l passed away decades before the first hesder yeshiva was founded. How could he have been against them? If you are referring to his son, harav Zvi Yehuda zt”l, I would be interested if you could refer me to a source. After all, leit man depalig that many of harav Zvi Yehuda’s talmidim founded and/or joined yeshivot hesder. As for harav Kook’s opinion against ascending to har habayit I believe that you are mistaken – it is well known in the D”L community and nobody denies it. #16- I think that you may have misread the article. Lior: Do you deny that R’ Shach said those things? Ironic that a short decade later, the book by David Berger “The Rebbe the Messiah, and the Scandal of Orthodox Indifference” was touted by Dr Shapiro’s crowd as a cudgel against traditional chareidi leaders. Could he at least candidly admit his own shortsightedness R’ Shach’s prescience? Yagel Libi #26: You’re 100% correct. old man #16 didn’t just misread the article, he misrepresented it. He has in the past, as well, misrepresented items in his postings here. It may be a result of his poor reading skills. Rachmuna Litzlon. And none of this is even unusual for Shapiro is his anti-Torah crusade and rantings throughout his career attacking traditional Orthodox Judaism. Could he at least loudly admit his own shortsightedness of R’ Shach’s prescience? During the Spanish civil war I found myself feeling very strongly that a true history of this war never would or could be written. Accurate figures, objective accounts of what was happening, simply did not exist. And if I felt that even in 1937, when the Spanish Government was still in being, and the lies which the various Republican factions were telling about each other and about the enemy were relatively small ones, how does the case stand now? Even if Franco is overthrown, what kind of records will the future historian have to go upon? And if Franco or anyone at all resembling him remains in power, the history of the war will consist quite largely of “facts” which millions of people now living know to be lies. One of these “facts,” for instance, is that there was a considerable Russian army in Spain. There exists the most abundant evidence that there was no such army. Yet if Franco remains in power, and if Fascism in general survives, that Russian army will go into the history books and future school children will believe in it. So for practical purposes the lie will have become truth. What is the fear, apprehension to hear truths spoken years ago??? Why is there a negativity to scholarship & historical research?? Regarding the above statements of Rav Kook zT”l … There is a mixup between the father Rav Avrohom Yitzchak Hakohen & his son Rav Tzvi Yehuda. E/o is aware of Rav Tzvi Yehuda’s “no ascent to Har Bayis”, while Rav AY was against women voting. Regarding Hesder yeshivos we are speaking of Rav Tzvi Yehuda & his negativity towards them was a fundamental haskafic issue between him & Rav Amital (who established the first Hesder yeshiva). The familial connection between the Kook & Elyashiv families was strong & secure. Rav AY Kook learned in a specific kollel together with the fathers of Rav Elyashuv & Rav SZ Auerbach. Rav Aryeh Levin was Baal Tefillah at Mercaz Harav Yeshiva & Rav Tzvi Yehuda was shadchan for his daughter with Rav S. Elyashuv. Learn the facts from the sefarim before they edit, revise & rewrite the “facts of life” of these families. #26 what are you talking about? the idea of hesder yeshiva was discussed by Rav Kook z”l in a well documented clear letter, in which he wrote that “no bochur who’s able to go to a regular Yeshiva should go to a Hesder Yeshiva”. By focusing on his preferred topics (e.g pornographic frontispieces, sexual references in Torah literature, etc.) Prof. Shapiro is similar to the “meshameres” described in Pirkei Avos, who takes the words of talmidei chachamim and retains the “dregs” (i.e. devarim beteilim) while discarding the “wine” (i.e. devarim ikari’im). you mention an auto-biography of one of the Gedolei haAcharonim that states horrifying information regarding one of his own contemporaries that heretofore had a sterling reputation? does anyone know which auto-biography is this , rabbi yaakov emden in his mitpachas seforim? Besides for the fact that mostly what is said in the name of the CI is questionable, who cares what RYBS said regarding RAIK? RYBS does not hold a candle to RAIK and does not begin to understand RAIK. Its comical how people who most definitely do not subscribe to RYBS use him to belittle RAIK. It’s mentioned alright, in the introduction, on pg. 33. Just Commenting #27: Shapiro has a lot more to apologize for to traditional frum Jews from a career full of attacking them in writing. To all the people bashing shapiro here — the agendas and opinions of the author are barely relevant. What needs to be discussed is the points he makes. How does the frum community feel about the information he has exposed? It sounds to me like we’ve chosen to attack shapiro as a way of distracting ourselves from the fact that, in this book, he has shown much of the haredi worldview to be ignorant and uninformed.